Over breakfast on the 7th of June 2011 we discussed the plans for the next week. Our quest was to find some icebergs..... We have been told that there are no icebergs in Twillingate as of yet, but there are some up in Saint Anthony. With our new found tool "The Ice Berg Finder" we set direction north on Hwy.430, the Viking Trail. It is a wonderful drive, however no speed records will be set on this trip. There are natural speed bumps in Newfoundland (not the only province) called pot holes, some I'm sure could eat a small car. This is especially true on the northern tip. Some of the other roads are pretty good though. Another hazard on the roads are moose, there are around 150,000 of them stomping around in the bush in Newfoundland. As you can understand it is easy to get into an accident. There are over 700 accidents a year on Newfoundland with moose. Most of these take place from May to October. Take your time, drive carefully and be alert, especially early morning and at dusk. Our first stop was The Arches Provincial Park. It is a small little park on the ocean with cave like arches in the rocks. This is supposedly ancient limestone carved by eons of pounding surf and tidal action have created these Arches. Inside the arches, it loos just like it was taken out of Star Wars. You can walk under the Arches or on top of them just be careful, the ocean is unpredictable and gives no warnings. The Arches Provincial Park includes a parking lot, a boardwalk, and a picnic area. Silvia and Jörg coming down the boardwalk surrounded by ghost like trees. According to Wikipidia, "the rock formation is composed of Ordovician aged dolomitic conglomerates of the Daniels Harbour Member of the Cow Head Group which has been eroded by sea wave action (what ever that means). These porous conglomerates can be oil-bearing, and areas near The Arches Provincial Park have seen some oil exploration activity." We continue our drive through this incredible landscape. The further north we get, the landscape changes, and the sub alpine tundra is becoming more and more dominant. 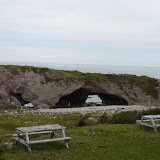 Port au Choix and Port au Choix National Historic Site of Canada are really neat places to visit. For over 5500 years, this small peninsula on Newfoundland's west coast has been the crossroads of various native North American and European cultures. The area's rich marine resources, and to a lesser extent the forests, wild game and abundant berries, have drawn these people to the shores and lands of Port au Choix. The interpretative center is really good with a short movie and tons of history information. Very interesting. The people who occupied this site connected the areas southwards to Maine, northwards to Greenland, as far west as the Canadian Arctic, and eastward all the way to Europe. Many remains of these cultures have been preserved at Port au Choix. This is thanks to the limestone bedrock of the area. The soils are alkaline rather than acidic and thanks to this alkalinity many artifacts has been preserved, even some of those made of bone and ivory. Over the past century various archaeologists have excavated several sites in the Port au Choix area. Through their work, there is now a better understanding of the many different people who called this site their home. After a great lunch in Port au Choix we continued our travels north. The landscape changes about every 30 km, it is wonderful to see such beauty; a true balance and harmony in nature. Newfoundland at it's best.... just keep it coming. We arrived at our campground Triple Falls RV Park, just before Saint Anthony. Another great campground right on a river with wonderful owners. Make sure to pick up some "Bake Apple" (cloud berry) jam made by a local lady (I bought all they had). It is so good. As a kid growing up in northern Sweden, I remember my mom making this jam.... we called the berries "Hjortron". Mom then made home made waffles, then added the jam and whipping cream. Yum! We booked in for two nights. Next on the agenda was Iceberg watching and L'Anse aux Meadows but we will cover that in our next blog. For more pictures from this part of the trip, click the picture below. Your rock photo looks like a painting by Kristina Boardman, a Victoria artist. I am impressed by the amount of information available at all these wonderful spots. I'm sure you could spend days at each place and still not see everything.